Head eastwards along the scenic coast road from Kalkan and the picturesque harbour town of Kas comes into view, its narrow jasmine scented cobbled lanes lined with Bohemian boutiques and a variety of Turkish and international restaurants. It is a popular, unspoiled place with interesting sights such as the various Lycian sarcophagi scattered around the village and many traditional Ottoman houses with their characteristic overhanging balconies. Towards the end of the Lycian coastline is Kale where attractions include a well preserved castle built by the Knights of Rhodes and the half submerged ruins of ancient Simena, an astonishing sight directly opposite the sheltered bay. Usually reached by boat from Kas or Kalkan, this particular part of the coast is full of surprises and history. The island of Kekova, for example, is a great example of the fortifications that were needed to survive the constant onslaught of marauding pirates besieging the trade convoys that sailed between Lycia and Greece centuries ago. Spreading out above the coastline there are beautiful gorges, valleys and mountains peppered with delightful villages and hamlets where the somnolent pace of life has remained virtually unchanged for centuries. A river flows through the hugely scenic Xanthos Valley and it is easy to see why ancient civilisations settled on the slopes of the mountain ranges flanking either side; apart from the obvious convenience of having a never-ending water supply, the fertile soil and far-reaching views gave a distinct advantage over the seashore villages. The Valley is also home to some of the most celebrated ancient Lycian towns including Xanthos, Latoon, and Pinara. One of the most remarkable archaeological sites in Turkey, the amphitheatre and Acropolis at Xanthos-Letoon are globally recognised and protected as a UNESCO World Heritage Site. 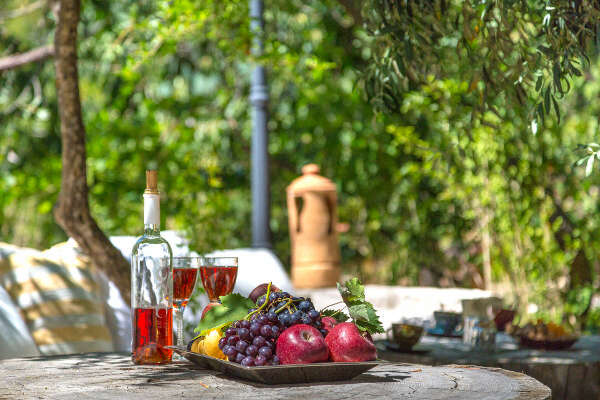 Pinara with its untouched mountain setting of fragrant pines, ancient olive trees, thyme-scented breezes and stunning views remains largely undiscovered and so retains its tranquil and somewhat mystical atmosphere. The principal centre of the Turquoise Coast is Fethiye, a lively port and market town. The fish market here is great fun! Choose your preferred seafood from one of the traders and you can take it straight into any of the surrounding restaurants where they will cook it to your exact requirements. Bordering Kalkan are the magnificent beaches of Kaputas and Patara (at 17km the longest beach on the Lycian coast) and travelling to them via one of the numerous water-taxis that leave from the town quayside is an enchanting, relaxing and scenic alternative. The region of Patara with its dunes and marshes as well as the ancient site of Patara itself is now a designated national park and a key biodiversity area, rich in birdlife, flora and fauna. As a recognised breeding ground for the endangered loggerhead turtle Patara beach has, commendably, been declared off-limits for any development in order to protect and encourage the turtles’ nesting activities. Turkish cuisine is simple and flavoursome, making good use of local produce, herbs and spices. Try a feast of meze, for which Turkey is justifiably famous. A selection of cold dishes is served first followed by platters of hot food: a truly sociable way of eating and ideal for sharing with friends over good conversation and a glass or two of local raki. Lamb features highly on menus along with local seafood and köfte (meatballs) for a range of offerings to suit anyone’s tastes. With over 200 restaurants squirreled away in all the special nooks, Kalkan has a vast array of choices to cater for all ages, preferences and pockets which is one of the many reasons people return year after year. Spectacular Saklikent Gorge, which cuts deep into the imposing Gombe Akdagi Mountains, produces a gushing cascade of limestone filtered water throughout the year. Exhilarating walks along manmade catwalks and in the shallower parts of the water itself allow visitors to marvel at the untamed power and beauty of nature. Bordering the gorge are various restaurants with wooden verandas jutting out over the river and furnished with cushions on which one can relax in true Ottoman style. Situated on the south western coast of Turkey, at the foot of the Mediterranean Sea, the Turquoise Coast enjoys long hot summers and beautifully warm springs and autumns, making it a wonderful place for relaxation and fun in the sun from early May to late October. From stunning infinity pools to the crystal clear water of the sea there are plenty of ways to cool off during the height of summer. Dalaman is the local airport for Kalkan and is well served by a variety of flights from many of the UK's regional airports. We do not tie you in to a package holiday with prearranged travel; you are free to choose flights from your closest airport using any charter, scheduled or low cost airline and at a time that suits you best. We always recommend that you book your flights as soon as you have booked your property as you will find that fares are usually lower and the choice of flight times is wider. If you would like to place a 'hold' on your chosen property whilst you are booking your flights we are more than happy to do this for you. We can book flights on your behalf if you would like us to, for this service we charge a fee of £30 for each return flight booked. 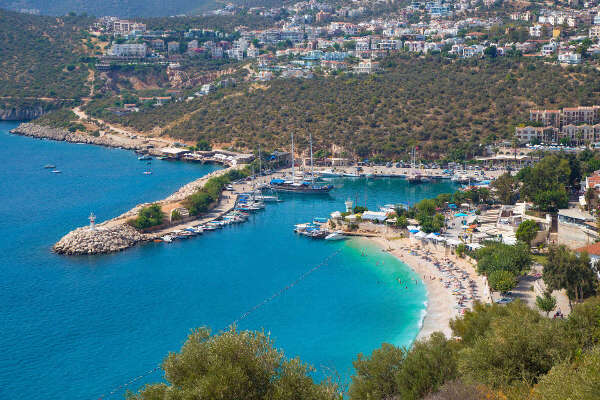 Nestled at the foot of the Taurus Mountains, on the shore of a half-moon shaped turquoise bay filled with olive trees and stunning bougainvillea, Kalkan is a small, traditional fishing town with a big heart. Dubbed the ‘Turkish Riviera’ on the Lycian Coast, it attracts a range of guests seeking everything from pure relaxation to stunning cultural sites, all set on this stunning stretch of coastline. The sloping cobbled streets of the Old Town are home to some of the most sumptuous cuisine in the area, and some of the best traditional wares available, all, of course, offered with a genuine Turkish welcome. The quaint harbour is home to many traditional Turkish gulets available for hire, a chance to explore the beautiful crystal clear waters of the bay, or perhaps to dive down to marvel at the wonders beneath the surface. Just a fifteen minute drive inland from Kalkan, sitting alongside the natural freshwater streams that cascade down the slopes of the Taurus Mountains, Islamlar is celebrated for its peace, tranquillity, wonderful views and excellent selection of waterside family-run restaurants (specialising in trout dishes). This is an immensely restful and laid back place where countless cups of Turkish or apple tea are sipped under shady trees and locally grown fruit and vegetables are offered for sale both in the local markets and at impromptu roadside stalls (shopping options in Islamlar may not be extensive but they are certainly friendly and colourful). However it is the restaurants that deserve special mention; it is no exaggeration to say that diners travel here from far and wide to enjoy the freshest of food served in these convivial, cooling and appealingly verdant surrounds.